Crystal clear and flexible,. LaboratoryTubing handles virtually all inorganic chemicals found in the lab. It is non-oxidizing and non-contaminating. Long-lasting and crack-resistant, Tygon Laboratory Tubing is less permeable than rubber tubing. The glassy-smooth inner bore helps prevent buildup so that cleaning is facilitated. Coils are marked at 3-foot intervals for easy measuring. Tygon Laboratory Tubing is specially formulated for resistance to flex-fatigue and abrasion. In many peristaltic pump applications, it will outlast its nearest competitor by at least 2 to 1. 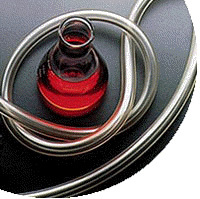 As a tubing for instrumentation connection, vent, drain andother general laboratory applications, Tygon Laboratory Tubing offers superior life, which minimizes the labor and expense of replacement.